The Lake Windermere Ambassadors care deeply about the lake and Columbia River watershed, and we know you do too. Lake Windermere is a special place and a vibrant hub of community; we wish to see it continue to flourish. Our vision is for an ecologically healthy Lake Windermere with balanced management approaches that support recreation and traditional uses, high fish and wildlife values, and economic prosperity in the region. 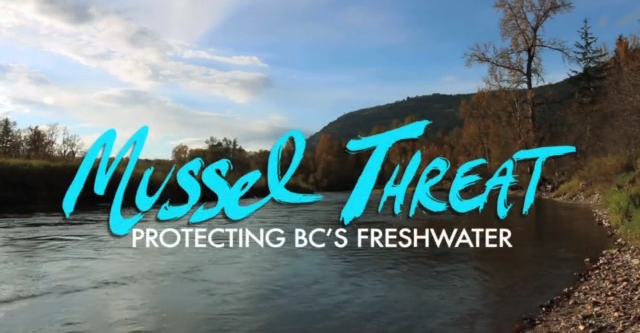 That is why we want to help spread the message about protecting BC lakes by preventing invasive mussels from entering our freshwaters. The Lake Windermere Ambassadors have written numerous articles in local newspapers to increase awareness about the threat and impact of zebra and quagga mussels. We have partnered with aquatic invasive expert groups to demonstrate boat washing and mussels inspections on local watershed tours and in outreach programs. We have even added veliger (mussel larvae) sampling to our annual aquatic plant survey, but we still need your help to get the word out! Reaction will not be effective here. Once zebra and quagga mussels are introduced in a lake or river ecosystem, there are no known methods to remove them. Impacts of an introduction of zebra and quagga mussels are well documented in North America – $5 billion dollars in impacts to water quality, recreation and tourism, fisheries and habitat values, drinking water infrastructure, and a greater risk for toxic algae blooms. Do you like to paddleboard, kayak, canoe, fish, waterski, wakesurf, fly a float plane, or just swim like a fish? Whatever you most enjoy about Lake Windermere, it’s vital that you clean, drain, and dry your equipment before moving from one water body to another, ESPECIALLY coming from out-of-province. As the Protect Our Freshwater Team says: It does add some steps to your day, but it also ensures that you will be able to keep enjoying that BC lake or river that you love. It just makes sense. The threat of a zebra and quagga mussel infestation looms large. Even though they are not yet established in BC, it is critical that our communities work together to keep it that way. Summer season is almost in full swing on Lake Windermere, and with that comes more of our beloved use of lakes, as well as travel between water bodies. The Ministry of Environment has established a new local Invasive Mussels Defense Team. They are stationed along the 93/95 and are mandated to inspect any watercrafts coming and going from lakes in the Columbia Valley. Cooperation with these trained officials is in all of our best interests, as they are helping to ensure the continued use of picturesque lakes on the Columbia River as we know them today. Whether you’re transporting a watercraft or not, you are always welcome to stop by a boat washing station to learn more about the program.